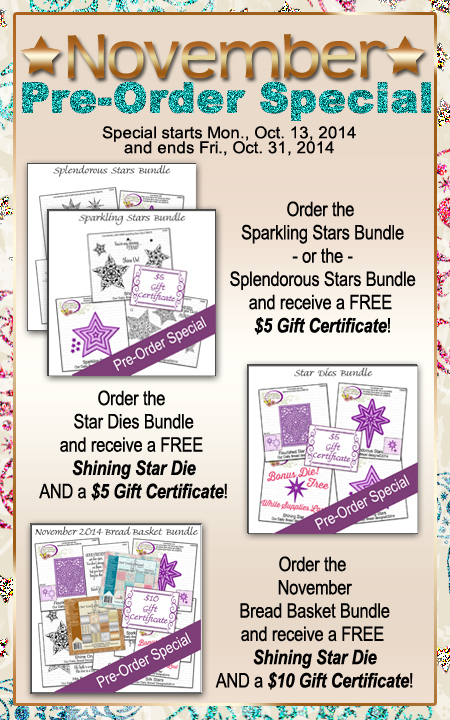 Welcome to a special Mid Month Release from Our Daily Bread Designs! You can see all of the October Releases here, the new Mid Month Releases are the ODBD Custom Holly Wreath Die, Christmas Pennant Row and Christmas Pennant Swag stamp sets. Continue reading below to find out how you can win one of three $15 Gift Certificates to the ODBD Store good towards the purchase of ODBD stamps. 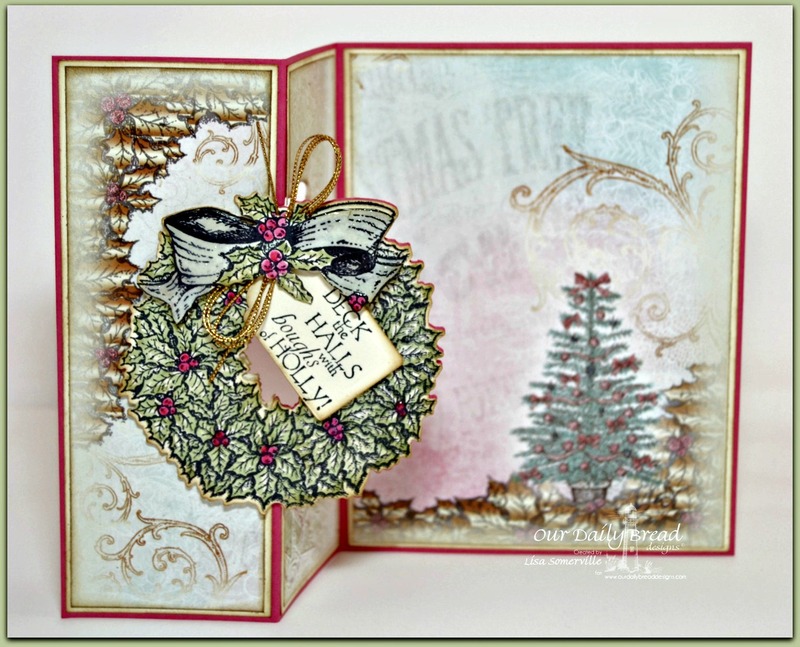 I created a Flip Card using the Holly Wreath Die along with the Holly Wreath stamp set, Recipe Card and Tags Die and ODBD Christmas Paper Collection 2014. After folding my card stock, I centered the Holly Wreath Die at the 2-1/8" score, adhering the die with removable tape, then I placed the top Acrylic Plate to the 2-1/8" mark and die cut. Leaving the die in place, I placed the "small center" from the die in place and die cut. 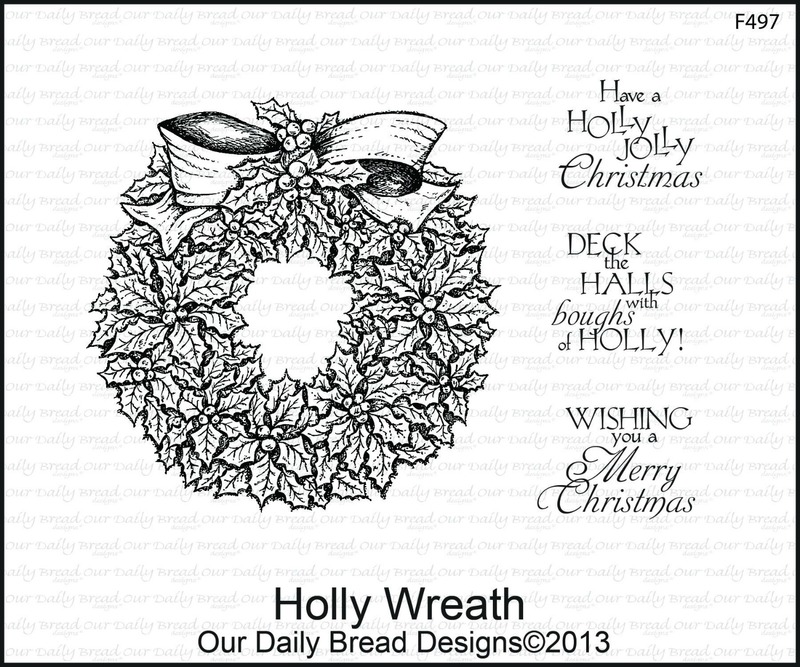 Stamp, die cut and color the Holly Wreath twice so that you can cover the area of the card stock that you just die cut. **Note, I added pattern paper and card stock layers to my Flip Fold base card, this is an additional step, and you'll have to repeat the die cutting of the wreath through those layers. Be sure to also check out the Pre-Order Specials for Our Daily Bread Designs November Release, click here for more details! Amazing! This is just so beautiful. This is just beautiful. That wreathe is stunning. 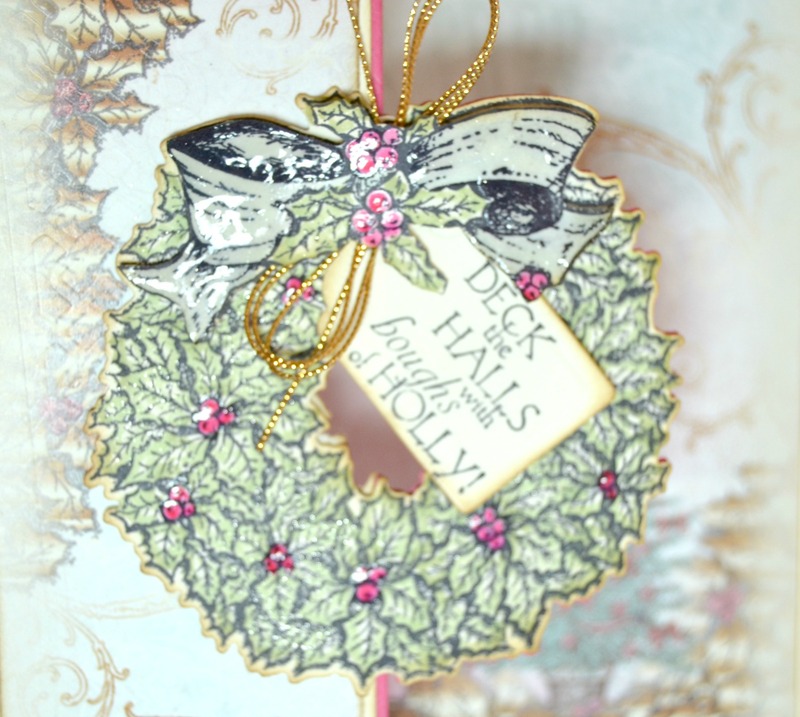 Very pretty flip card with this wreath. Simply Stunning card love the card base style. The soft colors of your wreathe and the inside is Beautiful. thanks for sharing. Wow Lisa...GORGEOUS!! LOVE your flip card, and fantastic papers!! Another fabulous design!! Love the fold design and beautiful papers to coordinate with the wreath! HUGS!! GMTA!! Love your flip card, Lisa! That new paper is yummy and so pretty with your wreath! This is beautiful, Lisa!! Love the coloring of your wreath, the gold edges and the fold!! So pretty with the new paper! 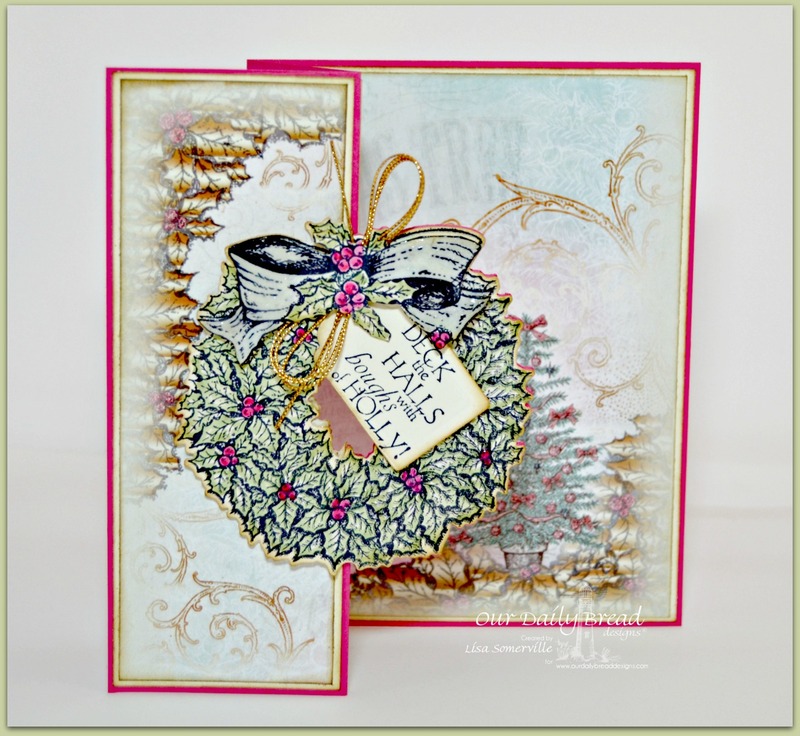 Lisa, this is gorgeous, and I love your card fold! How funny that I was thinking of doing this same kind of fold myself with the wreath - and you beat me!! You've done a beautiful joy, and I love the ODBD papers! Stunning! Hugs, sweet friend! Lisa, your card is so pretty. Love that flip fold! I must give it a try. Lisa your flip card is just beautiful! I love the new paper and can't wait to get it and start playing with it!!! Beautiful design!! Such a lot of work, but sooo worth it! Gorgeous card. Love the coloring on the wreath, and the whole design. Tfs!